Remove silver skin from underside of ribs by grabbing with a paper towel and pulling off. 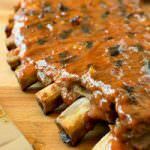 In a roasting pan equal in size to the ribs, place rib rack along with 1½ cups of Mozelle’s Barbecue Sauce. Slather all over ending with meat side up. Cover with parchment paper, then foil and bake 90 minutes. Remove from the oven and flip the rack over so the meat faces down, then cover back up and bake 90 more minutes. Remove rack from pan and discard liquid. Rack will be fall apart tender so be gentle. When ready to serve, preheat grill to a medium heat. Using a brush, remove any remaining sauce or liquid from the ribs and pat dry with paper towels. Brush the meat side of the ribs with oil and place meat side down on preheated grill. Grill just long enough to add gill marks, about 4-5 minutes. Flip and add grill marks to the other side. Remove to a cutting board, and slather with extra Mozelle’s Barbecue Sauce.